Stylish, fashionable, figure reminiscent of Pippi Longstocking, she passionately committed to the ideas of conservation. 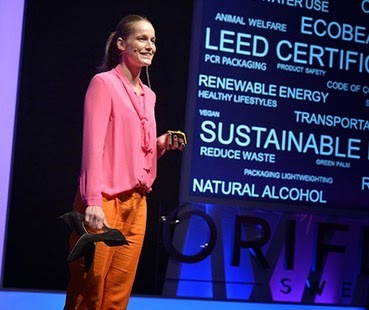 Meet Vice President Oriflame quality and sustainable development Antonia Simon-Stenberg. As the beauty industry coexists with the concept of sustainable development? The answer to this question knows Antonia Simon-Stenberg. Her job is to every day to prove: you can look great and do not feel guilty for the harm caused to the environment. Her work connects two of the world that are equally close to her: serious science and radiant glamor. Of course, this could not interest us, and we asked Anthony about her approach to beauty. Connected between a beauty and sustainable development? - Inseparable! We have just finished developing a new strategy for sustainable development, which involves the creation of a responsible approach to cosmetics. Our client should only think that what cosmetics she needs, and not worry about the ingredients that make up the moisturizer or lipstick. Why did you decide to make a career in the beauty industry? - I like the glamorous side of the business, as well as enjoy its mix of serious scientific and technical developments. - Recently we launched the first beauty brand that received certificates of all the world's leading independent organizations dealing with sustainable development (we are talking about a brand Ekobyuti - approx. Ed.). Inspiration nature and respect for the environment - the key to our product philosophy. - Flawless skin - my main goal. And since I have already selected to the 40, I need so much care of the skin, which involves intense hydration. Of the products that I use constantly, I can name a mild remedy for cleansing, moisturizing day cream, nourishing night cream. I also regularly use a serum to improve skin tone and make her shine.